We live our lives constantly on the move and at a frightening pace, more often than not under an immense amount of stress. The National Portrait Gallery is encouraging Londoners to grab a little head space in their lunch break and let a dose of arts and culture soothe the soul. In an age-old city steeped in history and oozing with culture, it’s sacrilege really to think about how easy it is for us Londoners to forget about the opportunities at our fingertips. So what better way to prompt would-be culture enthusiasts to support the arts than a tightly targeted campaign in Coffee Shops within walking distance of the National Portrait Gallery! 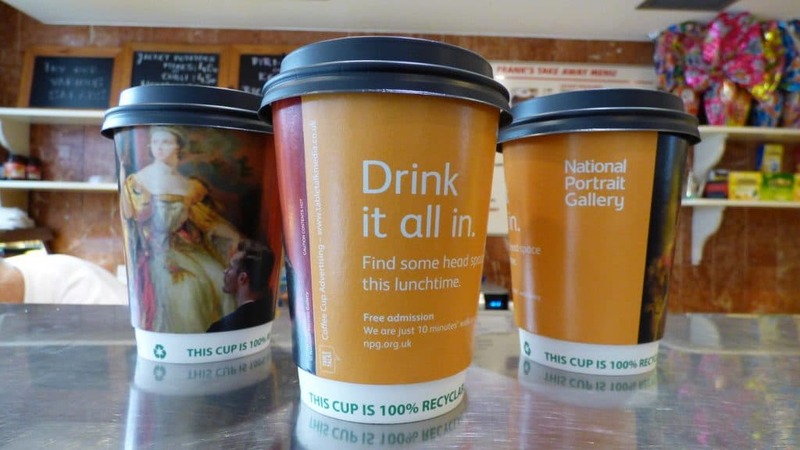 With the majority of takeaway coffee purchased in the morning by city workers on their way into the office, it makes perfect sense for the National Portrait Gallery to advertise on branded coffee cups prompting a visit to the Gallery during their lunch break. Especially when the timing of the message is reinforced by the fact that 50% of takeaway coffee cups end up on a desk in the office acting as a talking point and further prompt for colleagues to join in the fun.